Lock in a great price for The Smallville Hotel – rated 8.8 by recent guests! Night manager and night hotel desk staff handled tired customer and exceeded expectations to make things more than right. 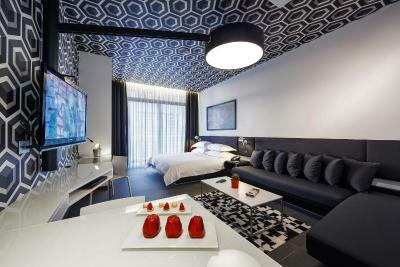 Like the apt feel and the fact that they have thought out all the little things a traveler might want or need. Infinity pool overlooking hippodrome racetrack was perfectly relaxing. The whole thing! Location .. Theme and the service above all. The staff were amazing! I was on a strict gluten free diet and i was taken care closely by chef Hassan and chef Christophe. They were just amazing! They were friendly, caring and very helpful. I felt just home! The hotel is really smart. Rooms are always nice. Bed is so comfortable. Only positive stuff to say about Smallville. The restaurant options. The quirky interiors and theme. The concierge, room service and housekeeping staff. Superb hotel with spacious rooms and great attention to details from the espresso machine to the little consumables. Walking distance to so many good restaurants and shops. Staff was friendly and professional. The rooftop bar with pool is a very nice touch. It was my second time and I got upgraded to suit which was excellent ! for sure, If I want to go there again for Similar meetings on that area, I will choose them for 3rd time. THE BED WAS LIKE A CLOUD ! The hotel was very generous to upgrade my room to a suite for my first time stay. I spent a lovely time by the pool. Amazing experience, high tech, very original decoration, great facilities, helpful staff, good location, penthouse and pool on the rooftop... and very healthy and tasty breakfast ! We were also upgraded to a suite... would definitely go back ! Hotel rooms are spacious. Rooms have balcony, they come with an L-shaped sofa, big enough TV and internet. Toilets are spacious. Check in was easy, staff are helpful. Rooms are clean. The Smallville Hotel This rating is a reflection of how the property compares to the industry standard when it comes to price, facilities and services available. It's based on a self-evaluation by the property. Use this rating to help choose your stay! 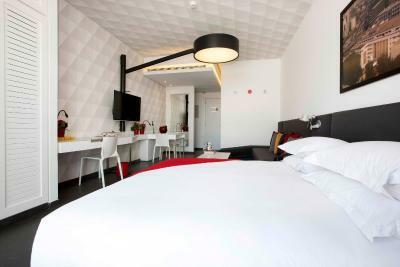 The Smallville Hotel is the only urban design, business and lifestyle hotel offering short and extended stays, located in the midst of the electric residential neighborhood of Badaro. It offers free WiFi, a fully equipped gym and a roof-top swimming pool. Guests can enjoy a free round-trip to the ski slopes by mountain services (seasonal). Consisting of of 117 spacious bedrooms, 39 suites and five day-lit meeting rooms, the Smallville offers you all the pleasures of a five-star stay.Not only so, but with its simplicity and elegance, this hotel is your gateway to the cultural and artistic beat of the city. The Smallville has a superb range of enticing options for dining or drinks. These include a restaurant, lobby lounge, stylish bar, garden space and rooftop, each with a mood of its own, and all available for hosting events, as are the hotel’s five meeting rooms and VIP suites. Leisure is taken care of by our gym and the pool whose sweeping views of the capital and its racecourse are not to be missed. Outdoor pool is open seasonally between the beginning of June till end of September. 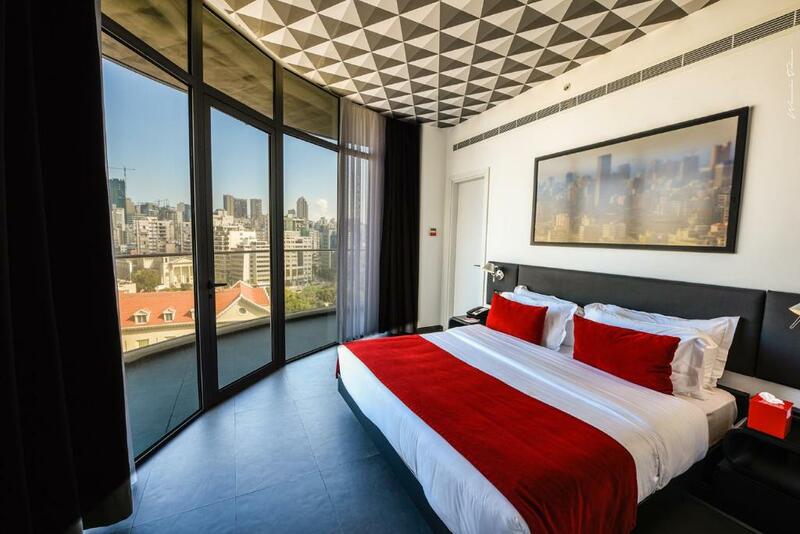 The Smallville Hotel is located within walking distance from National Museum of Beirut. It is a 10-minute drive from downtown Solidere with its nightlife and shopping outlets. It is 6.2 mi away from Rafic Hariri Airport, Beirut Central District, Verdun and Hamra. When would you like to stay at The Smallville Hotel? Featuring a modern setting, this air-conditioned room provides with a double bed, a flat-screen TV, free WiFi and a mini-bar. 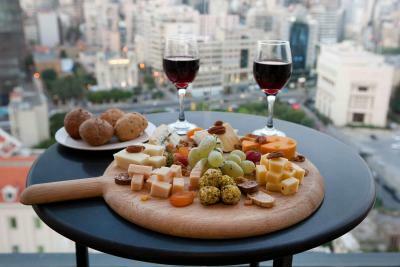 It offers a balcony overlooking a city or mountain view. In addition the bathroom includes a shower. This room includes free access to the pool and gym and 10% discount on food. Guests can enjoy a free round-trip to the ski slopes by mountain services (seasonal). Private parking is available on site (reservation is not needed) and costs USD 13 per day. Featuring a modern setting, this spacious, air-conditioned suite offers a large double bed, free Wi-Fi and a living room with a flat-screen TV. It comes with a balcony overlooking the city or mountains. The bathroom is fitted with a shower. Featuring a modern setting, this spacious, air-conditioned suite offers a large double bed, free Wi-Fi and a living room with a flat-screen TV. The bathroom is fitted with a shower. Featuring a modern setting, this spacious, air-conditioned suite offers a large double bed and single bed, 2 bedroom, free Wi-Fi and a living room with a flat-screen TV. It comes with a balcony overlooking the city or mountains. The bathroom is fitted with a shower. This twin room has a microwave, electric kettle and DVD player. House Rules The Smallville Hotel takes special requests – add in the next step! The Smallville Hotel accepts these cards and reserves the right to temporarily hold an amount prior to arrival. Please note that the hotel can arrange an airport shuttle to Rafic Hariri Airport at an added fee. The staff were too helpful. They rang the room to see if we wanted anything and then people would knock on the room door to ask if we wanted anything. I felt it was too much. Spacious rooms. Lots of restaurants and cafe/bars close by. Minor Late Check-in Issue... Night manager and night hotel desk handled issue flawlessly to accommodate late traveler and to confirm cleanliness of room. Beds were super comfortable. Staff friendly and most importantly it was in a great location. You cannot set the ac on cooling! -Little Overpriced. -Pool and Rooftop bar booked for private events almost all the time -lately becoming very calm in the evening with 2 or 3 customers at the restaurant. (They need to rework their marketing to bring/keep the crowd to their very nice « secret garden ». -Good service, very helpfull staff, -Nice restaurant and great food quality -Convenient location. Airco didn't work in our room. When we were relaxing at the pool, nobody bothered to ask whether we wanted to order something for the bar, but kept staring at us and continued to test music equipment and lighting (for a pool party later?). Parking is very expensive and they did not inform us there was free parking just around the corner. Check-in took a while although the room was prepaid. Incredible French restaurant Merry go round with great waiter. Quirky, friendly hotel and welcoming helpful staff. No comment, there really isn't anything I have a negative comment on. Breakfast was very good and included items that I haven't seen previously in other hotels. Table set up and location was very nice as well. Thé rooms are big and pillows are so comfortable! Very clean and the employees are nice!! Poor services, takes 2 days and 3 reminders to get support for maintenance. This is the 2nd time it happens to me. Last visit the heating unit was not working, the room was freezing, and I had to wait for full night till next evening to get the maintenance despite phones calls and in person requests at the front desk. Same story this time, I needed support for the room as it was smelling and maintenance team to fix something in the room. I only got it done 24hours later and after 3 calls/reminders and complaining at the front desk. They only react when customer gets frustrated. No response for complaints as long as customer is not yelling or shouting. Nice, clean, animated restaurants and lobby, good food quality, and friendly staff (front desk and restaurant). Excessive noise in the morning whether from the surrounding area or from within the hotel. The hotel also discourages deliveries from outside restaurants which was a let down. Great location and a unique concept.